Almost everyone I talked to was in disbelief. There was no way I could run a half-marathon after training for only five weeks. Sure, I would finish the race no sweat, but there was little chance that I would actually accomplish anything significant. That morning started off like any other. I had a giant bowl of oatmeal filled with seeds and berries before trying my hand at the crossword. Upon remembering it was Sunday, also known as ‘impossible crossword day’, I ditched the newspaper and decided to meditate instead. I knew that I was going to feel a great deal of pain that day; even worse, all of it was going to be self-inflicted. Meditating on that notion got me thinking. Aren’t all great runners gluttons for pain? It’s been argued ad nauseam in past years that running is an activity that comes naturally to us (see Born to Run among others). While I don’t entirely doubt that theory, recognizing that we’re instinctually meant to run doesn’t make the act any less painful. I like to think that my meditation that morning helped me to silence it, if only for an hour and a half. I arrived early at the Union Green in the heart of Middletown to help distribute race packets before the event got under way. 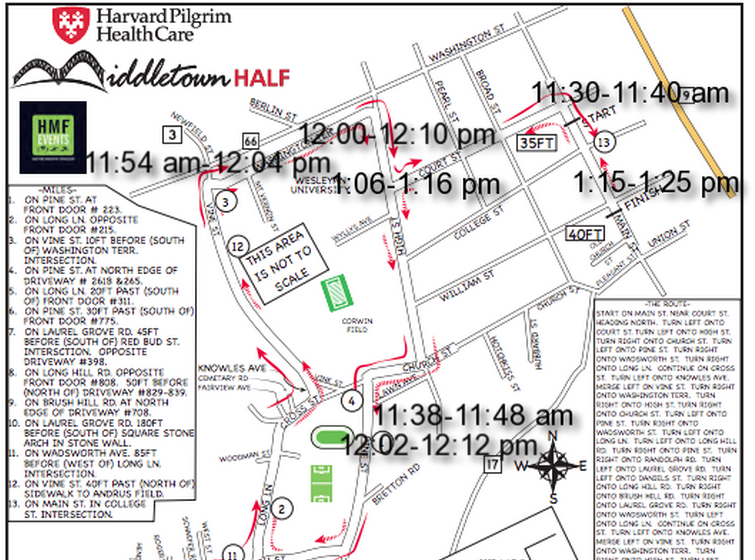 Both the start and finish of the half-marathon takes place on Main Street, which runs parallel to the Union Green. During my time as a volunteer, Main Street was extolled over the loud-speakers as the “most romantic main street” in the continental U.S. (evidently those Alaskans are great city-planners) no fewer than five times while “Eye of the Tiger” seemed to blare on repeat for half an hour. With fifteen minutes left until race time, I was released from my duties to take a quick jog, empty my system, devour a banana, and find a place near the front of the pack at the starting line. 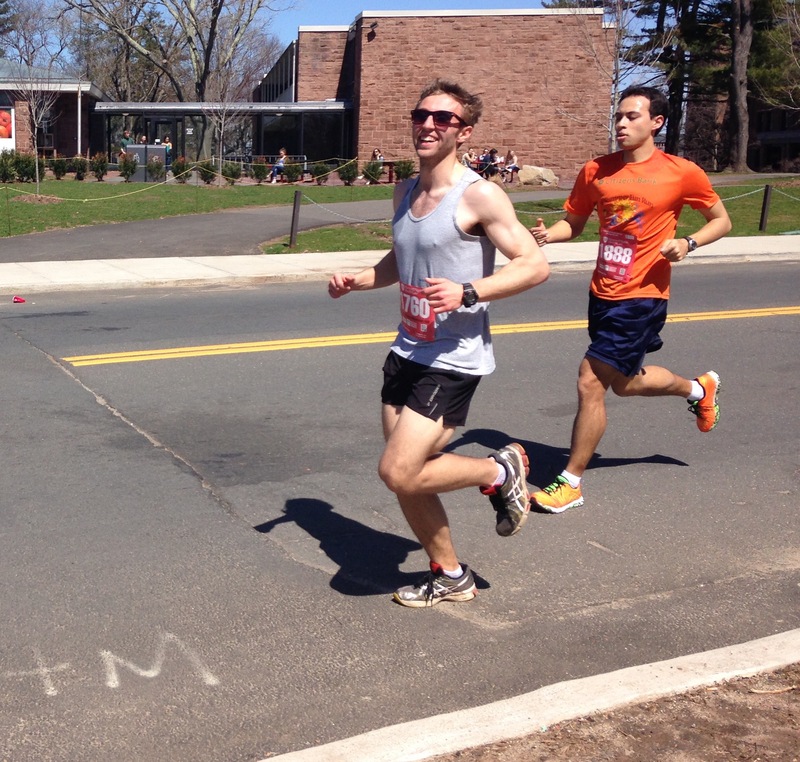 Galloway, Rodgers, and Burfoot at the 2014 Middletown Half. Although I considered myself to be a pretty serious runner before coming to Wesleyan, I had no idea the kind of running royalty that once called this place home. During the late 1960s, the Wesleyan cross country team was led by three greats: Amby Burfoot, Bill Rodgers, and Jeff Galloway. Burfoot and Rodgers would both go on to win the Boston Marathon (Amby during his senior year at Wes), while Galloway is a former Olympian runner who now conducts training programs on a regular basis. Although Rodgers couldn’t make it to the event this year, Burfoot and Galloway led the charge by giving rousing speeches at the starting line. Just before the opening gun, I realized that I was standing a few paces behind Amby, the long-time editor of Runner’s World magazine. In an instant, I could sense that there was a bit of luck in the air. ‘Burfoot’, after all, looks a lot like ‘rabbit foot’. Sure, it might be a stretch, but I needed any boost in confidence I could get at the time. Although seemingly unrealistic, I’ve found that a strict adherence to these guidelines has been the key to my success thus far. There is a caveat, of course: if I were to start at the very, very front, I would inevitably be passed by a bevy of runners within the first mile. Therefore, the key in keeping with these rules is to start close to the front, but not too close. Any runner, young or old, will tell you that there is nothing more demoralizing in the world of running than being passed during a race, especially when it is done inconspicuously. And that is precisely why my second rule is so important– to ensure that once I pass another runner, they will be unable to muster the strength to regain their position and I will be propelled ahead in the race. My goal pace for the half-marathon was about 8:00/mile, which even I believed to be wishful thinking, as I was averaging an 8:45 pace during my training. After finishing my first mile in 7:45 I made a mental note to slow my pace moving forward while still doing my best to keep rule number one. As the miles dragged on, however, I found that instead of tiring, my legs were coming alive. The steep, arduous Connecticut hills that I’d been dreading became mere ant hills. In fact, the majority of the people I passed during the race came during the more hilly portions. Naturally, other runners were bound to pass me at some point in the race, but I was determined to hold them off for as long as possible. My streak finally broke around mile seven, when a runner I had met while volunteering passed me in full stride. Then, just moments later, another runner who I’d passed earlier caught up to me and struck up a conversation. He stood about 5’7″, wore a neon green tank top along with aviator sunglasses, slicked back hair, and tattoos running up and down his arms. After a bit of nervous laughter on my part, he introduced himself as Dave and would later tell me that he downed six beers the night previous and was training for the Providence marathon in October. His wife used to work for Wesleyan and he thought Olin Library was the most beautiful building in Connecticut. Although I don’t have much experience with edifices in Connecticut, I saw no reason to disagree with him. Around mile nine, Dave broke off ahead of me, but only for a short interim. I managed to pass him again around mile ten and we remained neck-in-tattooed neck for the remainder of the race. The big finish came on Main Street. After turning in from a side street, Dave and I spotted glory: the finish line was no fewer than 1,000 feet in front of us. Only one thing was separating us: our ability to minimize our subjective experience of pain. And boy, was I ever in pain. As the $55 professional pictures depict, I put everything I had into those final 500 feet. Thanks to my biology, I will never give birth to a child. Judging solely by the finish line photos, however, it would appear that I had twins right there on Main Street. The agony on my face as I pushed for every inch give me chills even now. In the end, the fight was worth it. Not only did I beat Dave, much to his chagrin, I also finished third in my age division, just two seconds ahead of the fourth place finisher, who I passed in those final 500 feet. As I crossed the finish line, I let out a byah à la Howard Dean, and then proceeded to run back to campus for a hefty brunch. I deserved it. Now, running as quickly as I did doesn’t come without its drawbacks. Earlier that week, I’d sent out a detailed map to my closest friends with the estimated times that I would pass certain locations on campus. The map was made thinking that I’d be running an 8:00/mile pace or slower. Needless to say, I only got to see two friends during the entirety of the run. 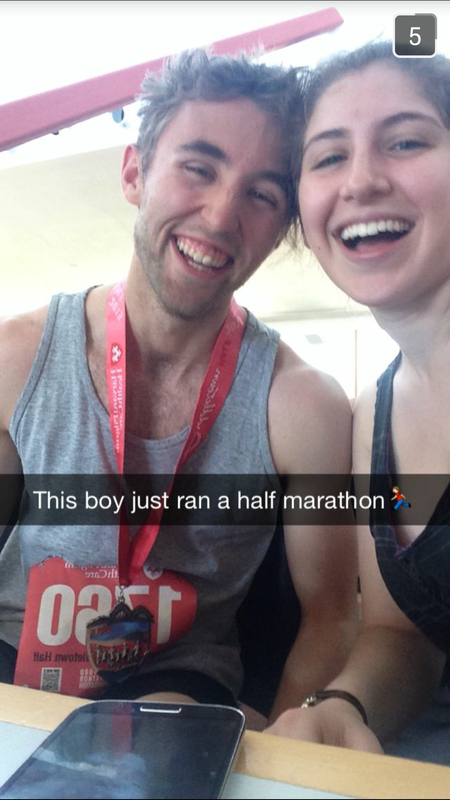 Altogether, my first half-marathon was more than I could’ve dreamt for. Perhaps most significant, it confirmed something that I had long suspected: I have a future in running. 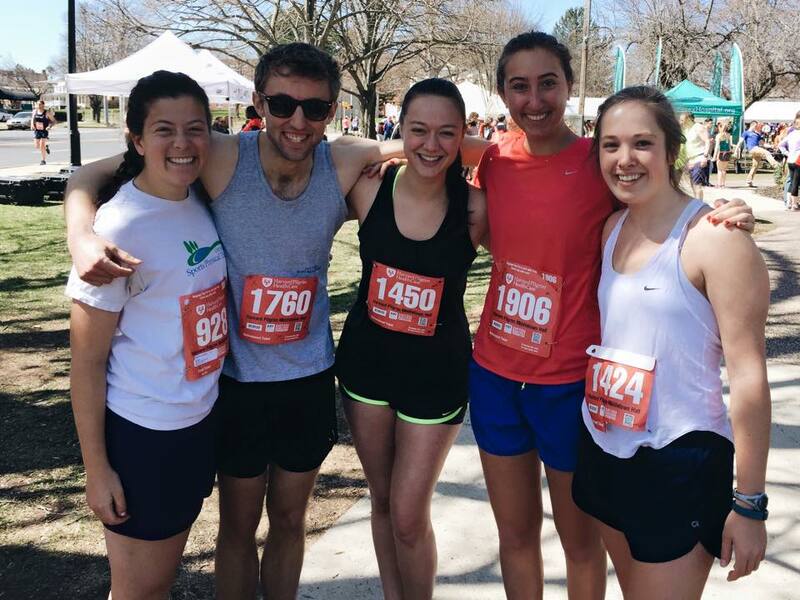 **Altogether, my first half-marathon was more than I could’ve dreamt for. Perhaps most significant, it confirmed something that I had long suspected: I have a future in hobby jogging.